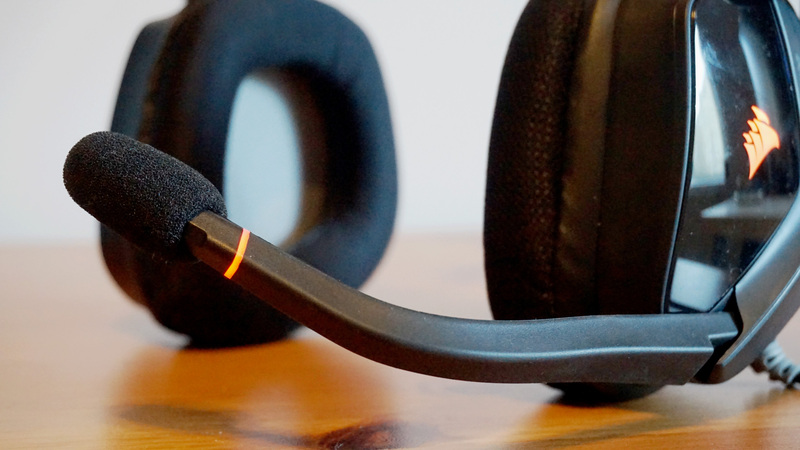 I thought it would be ages before I found another pair of headphones that could rival Steelseries’ superb Arctis 7 for best gaming headset, but it turns out great headsets are a bit like buses. You wait ages and then two come along at once. This time, it’s Corsair’s Void Pro RGB. Now I wouldn’t go as far as saying the Void Pro tops the Arctis 7, but it does come a mighty close second. Available in wireless, USB and non-RGB ‘Surround‘ models, the Void Pro is supremely comfortable. 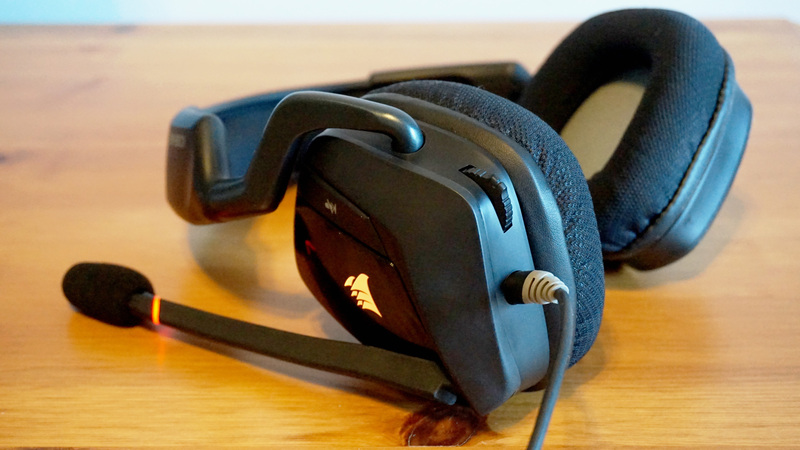 This surprised me, as the Void Pro looks and feels like a lot of lesser headsets I’ve tried before – a fair amount of padding on top, but fundamentally a pretty traditional headband design. However, whatever kind of memory foam/microfibre combo Corsair’s used here absolutely works, as I was able to wear the Void Pro for hours on end without the slightest bit of discomfort. I suspect it’s probably because its overall design is somewhat looser than your average headset, as I was able to move it quite easily around my head even when it was on the tightest adjustment setting. The upside is that its looser fit prevents the whole thing from constantly feeling like it’s pinching your skull. On the other hand, it’s probably not the best choice if your head happens to be particularly small, particularly when the ear cups are also quite large. Still, it’s not like I felt it was about to slide off my face at the drop of a hat, and unless you like moshing to thrash metal while playing games, I don’t really foresee it being a problem. The plush ear cups felt more than secure against the side of my face, and I had to exert quite a bit of force to knock them off my ears. Admittedly, the copious amount of plastic on the USB version of the Void Pro on test here doesn’t really reflect its somewhat premium price of £80/$80 (or £95 if you’d rather pay full whack over on Corsair’s own website). I don’t really have an issue with it on the main headband, but when you start moving the bendy, fold-down mic into position, it just looks you’ve accidentally sat on it. The mic’s also made from that kind of thick, slightly rough kind of plastic that always manages to look a bit scruffy after you’ve used it for a while. To its credit, the microphone is excellent. Speech was crystal clear when I recorded myself talking in Audacity, with only the occasional bit of pop/audible wind effects creeping in on a couple of hard plosives. This was quickly rectified by applying the bundled foam windscreen, though, which eliminated all pop effects in one fell swoop. The Void Pro’s quite light on onboard controls. All you get is a microphone mute button on the left ear cup (which activates a thin LED band near the base so you can tell it’s inactive if you don’t have audio feedback turned on) and a small volume rocker that controls your PC’s master volume, but you can find more settings in Corsair’s Utility Engine software (or Cue, for short). I’m not the biggest fan of Cue. It’s nowhere near as simple or intuitive to use as other control centres I’ve put up with in the past, but it gets the job done. In it, you’ll find equaliser settings for its five preset modes as well as the option to create your own, microphone volume and sidetone sliders (how much you can hear yourself through the headset when you talk) and RGB settings for the light-up Corsair logos on each ear cup. You’ll also need Cue to activate its Dolby 7.1 surround sound feature, as annoyingly there isn’t a dedicated button for it on the headset. Much like other 7.1 headsets, this is all done via software – you’d need seven individual speakers and a subwoofer for true 7.1 surround sound – but in truth I didn’t feel there was a huge difference between having it on or off. In Doom, the soundscape felt a little wider and atmospheric with 7.1 enabled, with imp fireballs possessing a fraction more bass and depth to them as they were hurled overhead, but the effect wasn’t particularly pronounced. It was even less noticeable in Wolfenstein II and The Evil Within, with each of its busy soundtracks sounding more or less identical when switching between each mode. Indeed, turning on the 7.1 Surround practically destroyed Hellblade’s binaural audio, throwing Senua’s plague of voices out in front of me instead of having them jostling for attention behind my ear. The whipping winds and rush and swirl of the world sounded great, but the struggle inside Senua’s mind completely lost its impact. That’s not to say the Void Pro’s audio isn’t good. Games still sounded excellent in regular stereo, and Doom’s gory finishers in particular sounded deliciously detailed as I continued to crack open fresh batches of demon skulls. Likewise, Hellblade once again sent shivers up my spine as its voices hissed and whispered in my ear, and the rapid clicks of Wolfenstein II’s guns sounded pleasingly weighty. It’s just a shame the 7.1 Surround doesn’t enhance it all further. General music listening, on the other hand, was a bit hit and miss. When I fired up my trusty Final Fantasy XV soundtrack, for instance, I felt its lighter piano tracks sounded quite muted most of the time, while its busier, more intense battle themes lacked the same kind of bass and impact I heard on Steelseries’ Arctis 7. Turning on 7.1 didn’t help much either. Other types of music, meanwhile, such as indie rock tracks or the pumping opening to the first season of Knights of Sidonia for example, were much clearer. The low end was still probably a smidge on the conservative side, but not so bad it wrecked the entire track. It’s a shame, really, as the Void Pro’s comfort and in-game stereo performance are arguably just as good as the Arctis 7 and the USB model on test here is less expensive, too. For me, though, the Arctis 7 is still worth the extra £40 expense (or just $20 if you’re in the US), as it not only bags you a more versatile headset that sounds great in any situation, but it’s wireless as well. If your budget doesn’t quite stretch that far, though, the Void Pro is still a great, if slightly flawed alternative. Tagged with Corsair, feature, Hardware, Headsets.